A Pop of Style: "If you do good, you'll feel good"
Four days after tragedy struck Newtown, CT, and it is still immensely painful to watch the news coverage of the Sandy Hook Elementary School shooting. The stories of the lives of the little children have started to be shared, and the love the teachers shared for their students is being spoken of by their loved ones. Our hearts are so heavy in these moments, and it almost seems as if there's no magic left in the world. If so much wrong had been done by a single person, then what left is there to do than for us to put forth goodness? 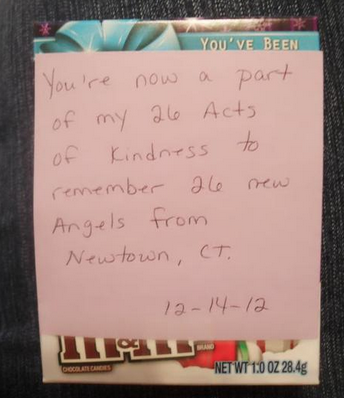 NBC's Ann Curry has started "26 Acts of Kindness," and is using her Twitter account to spread the word. Since then, 26 Acts has spread almost like wildfire, and Curry has retweeted some of the acts people have shown toward others. As MLK Jr. said, "darkness cannot drive out darkness, only light can do that. Hate cannot drive out hate, only love can do that." Here are a few of my favorite retweets from Curry over the past couple of days. I encourage you all to take part in 26 Acts of Kindness. There's good in doing good, and it is one of the best ways we can honor the innocent victims who lost their lives last Friday.